We provide complete customization to our clients and make these Storage Tank as per their required specifications, whether it is Ms or SS, its use depends on usage of the tank and also as per client’s specifications. 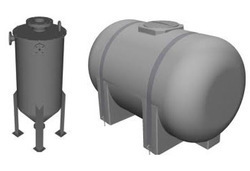 These tanks are corrosion resistant and easily stand various temperature fluctuations and variations. These tanks have a wide demand in various processing industries because of them being highly effective at economy rates.